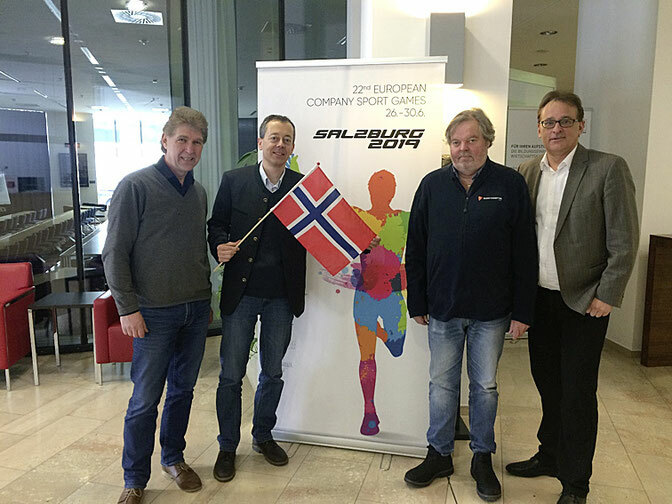 L to R: Tore Stokdal (Oslo company sport association), Reinhard Sitzler (sport director of ECSG Salzburg 2019), Stein Aker (Oslo company sport association), Klaus Höftberger (managing director of ECSG Salzburg 2019). Zu den „ECSG Salzburg 2019“ werden ca. 300 Teilnehmer aus Norwegen erwartet. Aus diesem Grund stattete kürzlich eine Delegation des Betriebssportverbandes Oslo Salzburg einen Besuch ab und machte sich persönlich ein Bild von den Austragungsstätten, den Hotels und der Infrastruktur. Weitere Delegationen erwarten wir Ende Juni im Rahmen eines Koordinatoren-Treffens. 30 Vertreter verschiedener Nationen haben ihre Teilnahme bereits zugesagt. Neben einer Präsentation zu den Eckdaten unserer Spiele steht auch hier die Besichtigung verschiedener Sportstätten, einiger Hotels und des Messezentrums als zentraler Punkt der Spiele im Mittelpunkt des Interesses. About 300 Norwegian participants are expected to attend ECSG Salzburg 2019. For this reason, a delegation from the Oslo company sport association recently paid a visit to Salzburg and took a look at the sport venues, hotels and infrastructure. Other delegations are expected to come to Salzburg for the coordinator meeting at the end of June. Thirty representatives from a large number of countries have already confirmed their attendance. In addition to presenting key information about the Games, our focus is also on showing our visitors the various sport facilities, some of the hotels and the Messezentrum, our headquarters during the course of the event. Près de 300 participants venus de Norvège sont attendus dans le cadre d’« ECSG Salzbourg 2019 ». C’est pour cette raison qu’une délégation de l’association des sports d’entreprises d’Oslo s’est rendue à Salzbourg afin de se faire une idée des infrastructures, des hôtels et des équipements existants. D’autres délégations sont attendues à la fin juin dans le cadre d’une réunion des coordinateurs. 30 représentants des différentes nations ont déjà confirmé leur participation. Outre une présentation des caractéristiques de nos jeux, nous visiterons aussi plusieurs complexes sportifs, certains hôtels et le centre des congrès servant de point central pour les matchs.